Canelo met with Golden Boy today - Big things to come? Canelo met with Golden Boy today – Big things to come? By Dan Ambrose: Former WBA/WBC junior middleweight champion Saul “Canelo” Alvarez (44-1-1, 31 KOs) reportedly stopped by Golden Boy Promotions Offices today to discuss his next fight in December. Golden Boy sent out a tweet hinting that the 24-year-old Canelo will have something big coming. What that big thing is we can only guess. #3 WBO, #5 IBF, #11 WBC James Kirkland (32-1, 28 KOs) has been mentioned as a possible opponent for Canelo to fight. However, that’s not a great fight, given how bad Kirkland looked in getting stopped by Nobuhiro Ishida in 2011 in a 1st round knockout loss for Kirkland. Boxing fans want to see Canelo fight a rematch with Erislandy Lara, who Canelo beat by a controversial 12 round split decision last July. 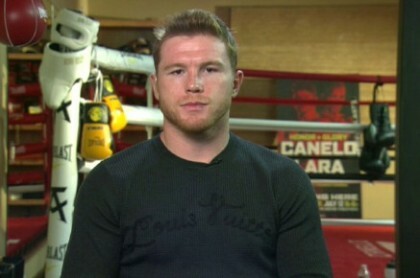 Fans also want to see Canelo fight Gennady Golovkin or Julio Cesar Chavez Jr. Putting Canelo in with Kirkland seems like another case of Canelo being carefully managed. He clearly has unfinished business with Lara after beating him by the following scores 115-113 and 117-111 for Canelo, and 115-113 for Lara. A lot of boxing fans saw Lara beating Canelo. Even the fans that saw Canelo winning thought the fight was really close. Canelo moving on from a controversial decision like the Lara-Canelo fight, it makes Canelo look bad in the eyes of a lot of fans. Canelo’s manager Eddy Reynoso reportedly wants Chavez Jr to move down from super middleweight to fight Canelo at 160. That’s obviously a really bad deal for Chavez Jr, because he balloons up in weight after making weight for his fights at 168. I don’t think Chavez Jr can get back down to 160, and if he does drop the fight, he’ll likely be as weak as Alfredo Angulo was in their recent fight last March. The Chavez Jr fight isn’t being talked about for December. As heavy as Canelo is, I don’t know why he doesn’t fight Chavez Jr at super middleweight. After all, Canelo rehydrates over 170 when he fights, and that makes him a light heavyweight. Boxing » Saul Alvarez » Canelo met with Golden Boy today – Big things to come?